Preparing collard greens allows your loved ones to enjoy a nutrient-rich vegetable, packed with fiber and vitamins A, B, C and K. This leafy, green vegetable is a staple food of Southern-influenced cuisine, complementing barbecue fare as a side dish and used as a component in soups. Collards taste similar to cabbage and are typically cooked with pieces of ham hock or bacon for extra flavor. 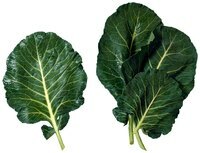 Collard green leaves are dense, requiring longer preparation than other greens. Boil and saute collard greens on the stove top to soften the texture and bring out the flavor quickly. Bring a large pot of water to a boil on high heat on your stove top. Cut the stems off collard greens with a chef’s knife. Detach the leaves from the center rub with your hands or a knife. Rinse the collard green leaves individually under water to remove dirt and pesticides. Repeat rinsing two to three times. Collard greens that are not well-rinsed have a gritty consistency from dirt residue. Place the leaves on a cutting board and chop them into 1-inch-thick pieces. Put the collard green leaves in the boiling water and boil them for 15 minutes. Drain the leaves in a colander. Press the leaves with your hand or a spoon to remove excess water. Heat 2 tbsp. of olive oil or butter in a skillet over medium-high heat until the oil begins to sizzle. Add the collard greens and seasonings such as minced garlic, salt and pepper. Toss the ingredients with a spatula, coating the greens in olive oil. Saute the collard greens for five minutes.